The judging venue for this year’s FNB Sauvignon Blanc Top 10 competition is Nederburg and lunch over the past three days has been taken in restaurant situated in the manor house on the property allowing my colleagues and I to cherry-pick from the Nederburg-only wine list. 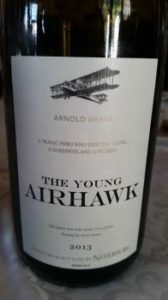 There were 234 entries into the Top 10 and you might think that the last thing we’d want to drink at leisure would be more Sauvignon but I must say the The Young Airhawk 2013, a wooded version of the grape, is the stand-out wine of what’s currently available to diners. Grapes were sourced from Elim, Darling and Durbanville and the wine fermented and matured for 10 months in oak, none new. Lime, peach and a little spice on the nose and palate. Really well-proportioned and still full of life. Turns out I’m not the only person who likes it with the wine having placed in last year’s top 10. Price: R130 a bottle.